The Model ESF sealing liquid monitor is designed for applications where uninterrupted seal water flow is required for cooling and lubrication. The ESF is compatible with all seal types and intended for water flows up to 3.5 gallons per minute. ESKO seal water monitors are also available in a dual tube Model EDF for double mechanical seals to monitor the water going in and out of seals. 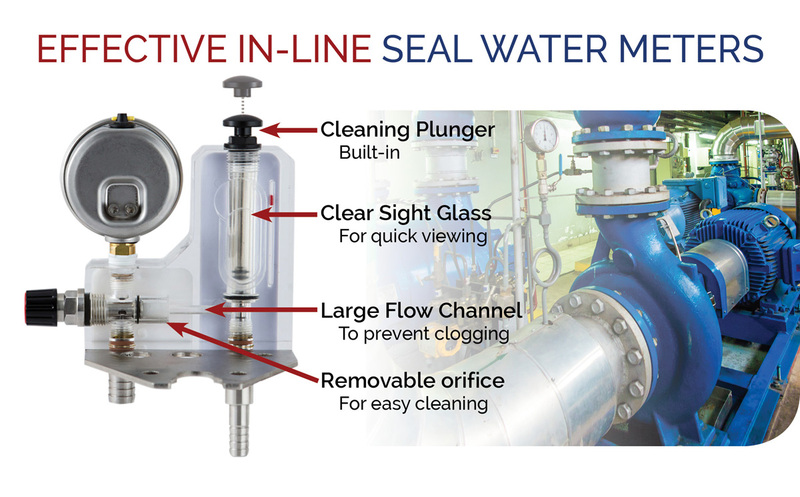 Effectively managing seal water use can result in cost savings on water consumption, reduced downtime, and optimized seal life and reliability. Both ESF and EDF seal water monitors assist in effective in-line seal water monitoring by providing an easy visual indication of water consumption. User and process friendly features such as a quick-clean plunger and anti-clog design simplify continuous water monitoring. Features and options include flow control valves, check valves and alarm sensors to keep operating personnel on top of how much water is being consumed. ESF and EDF models have an optional adjustable alarm sensor to alert operators about low flow situations which can damage the mechanical seal(s). A WIKA pressure gauge can be mounted directly on the meter to visually indicate operating pressure fluctuations. Metering tube material choices are available to ensure that the meter is customized for operating conditions and flow media. Model ESF comes standard with a shatter resistant PSU metering tube which is suitable for typical seal water applications. Some customers prefer glass or PES tubes for better temperature and chemical resistance. Even though the flow medium may be only water, some operating environments have corrosive chemicals OUTSIDE the flow meter which may guide metering tube material selection. For installation ease, a variety of connection choices are available to accommodate different piping options. ESKO can custom build these meters with different connections on the inlet and outlet.